There are those days where we wake up late or the kids demand a little too much from us in the morning. And then all we have left is 10 minutes or less to take care of ourselves. I honestly don’t think there’s been someone who has been able to escape this problem. And that’s why I decided I’d find a few 5-minute super easy hairstyles for those rushed mornings. No one wants to go to work or drop off their kids at school feeling like they look like a mess, and these 5-minute hairstyles will help you with exactly that. So check them out and let me know what you think! For me, buns and braids are a couple of the easiest hairstyles to do (and some of my favorites too). Combine them and you get a super cute look. I love this hairstyle. 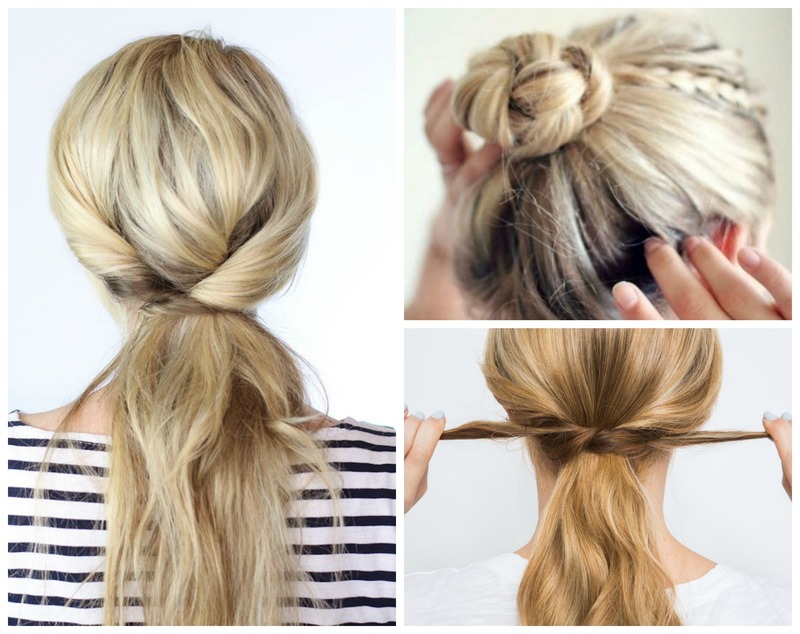 I have thick hair that takes forever to curl, but with this ponytail trick, I have it done in minutes. Definitely something try! I’m kind of a chignon lover; they’re super classic and cute. Also, they’re super easy with is plus for a busy morning. If your hair isn’t quite at the length you want it at yet, then this will be a great hairstyle for you. Beach waves are the best. So if you’re going for an windblown look for the day, then this is an easy style to try out. Something says “super simple” about this hairstyle. It takes only just a couple of minutes to tie up and then you’re out the door! Half crown braids are really elegant but also very easy. With some quickly done braids, you’ll have it done in no time. For those mornings when you hit snooze or those evenings when you’re late to get together with a friend, this style will look good almost anywhere. If you have long hair like me, then combing it and walking out the door isn’t always an options. Sometimes it has awkward kinks from the way we slept or something just doesn’t look right. So any easy and super quick hairstyle is a must. Now some of these hairstyles may require you to practice it the night before (as practice makes perfect). So try them out, let me know what you think, and if you have any questions, just let me know in the comments down below! Amazing! Love these quick tips.